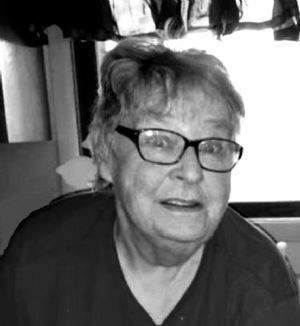 Susan Kay Rank, age 74, of Ripon, WI, was walked home on Tuesday, November 13, 2018, at Kindred Hearts of Green Lake, WI. Sue was born on January 12, 1944 in Ripon, the daughter of Nelson and Winnifred (Fish) Lueck. She graduated from Ripon High School and attended Messiah Lutheran Church in Ripon. Sue's greatest love is that of her grandchildren and great grandchildren. When they would be around her or with her, she could move mountains, her smile would go on for days. With or without words, she always found ways to communicate her love for each one of them. She also enjoyed caring for children throughout the community. There were many children who were touched by her great love and grace. Her gentle compassion for everyone around her was shown through others. She used her skills to prepare delicious and comforting meals for family and friends. Her great love of Elvis was beyond measure. He provided her a comfort and excitement. Sue's life serves as an inspiring legacy of love, strength, and compassion. A beloved mother, grandmother, great-grandmother, sister, and aunt. She is now in peace with the Lord. During her final days she was cared for and comforted by Southern Care Hospice. She was surrounded by family and God's love as she entered the Kingdom of Heaven. Sue is survived by her son, Kevin (Sheryl) Rank of MO and their children, Brittany and Camaron; daughter, Lisa (Peter) Bogucke of Princeton, WI, and their children, Stephanie (Jim), Amanda (Ben) and her son, Spencer, Jonathon (Amanda), and Josh (Ashley); and son, Rick (Ann) Rank of Randolph, WI, and their children, Nelson and Kolin; 13 great-grandchildren; and a sister, Nancy Bardsley of Ripon, WI. She was preceded in death by her parents, Nelson and Winnifred Lueck and a sister, Patricia Halverson. Visitation for Sue will be held from 10:00 to 11:00 am on Friday, November 16, 2018 at Butzin-Marchant Funeral Home, 515 Mayparty Dr., Ripon, WI, 54971. A Memorial Service for Sue will be held at 11:00 am on Friday, November 16, 2018 at Butzin-Marchant Funeral Home, with Chaplain Kevin Haworth officiating. Inurnment will follow at Hillside Cemetery in Ripon. Memorials may be directed to Southern Care Hospice, 885 Western Ave. #200, Fond du Lac, WI, 54935.